Oil prices tumble more than 2 percent, adding to steep losses in October. Russia, OPEC and the United States are pumping more oil before U.S. sanctions on Iran return in full force next week. The U.S-China trade dispute is threatening to slow global economic growth and dent demand for crude oil. 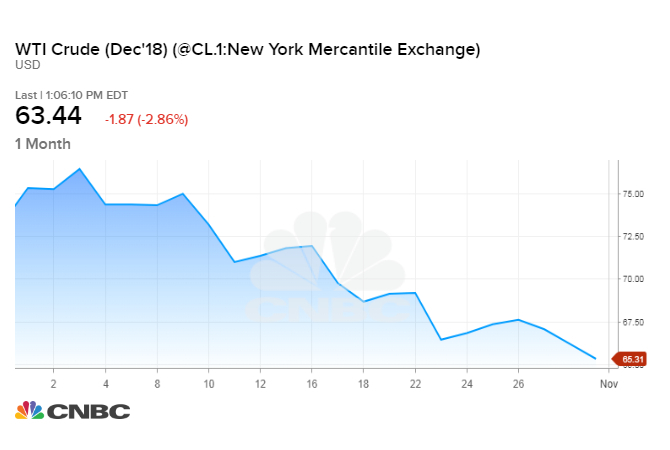 Oil prices fell more than 2 percent on Thursday, with U.S. crude hitting its lowest level in nearly seven months as last month's steep losses continued into November. U.S. West Texas Intermediate crude ended Thursday's session down $1.62, or 2.5 percent, at a nearly seven-month low of $63.69. The contract bottomed out at $63.11 earlier in the session, its weakest price since April 9. Brent crude, the international benchmark for oil prices, was down $2.07, or 2.8 percent, at $72.97 by 2:30 p.m. ET. It fell as low as $72.56 on Thursday. Both benchmarks posted their worst monthly drop since July 2016 in October, with WTI down nearly 11 percent and Brent tumbling almost 9 percent. Crude futures got caught up in a broader sell-off in global equity markets in October, sinking as investors sold risk assets. But oil prices have continued to drop even as stocks claw back some gains. U.S. crude is now trading at levels not seen since the month before President Donald Trump restored sanctions sanctions against Iran, OPEC's third biggest oil producer. The looming sanctions on Iran's energy sector, which go into full force next week, have played a major role in the oil market's rally to nearly four-year highs just one month ago. Iran's oil exports have shrunk by about a third as crude importers wind down their purchases ahead of Washington's Nov. 4 deadline. Iran was still selling about 1.7 million to 1.9 million barrels per day in September. The Trump administration is reportedly nearing dealswith India and South Korea that would allow the countries to keep buying some of Iranian oil. The market is also growing confident that output from other sources can offset the declines. "The Trump administration was saying we're going to go to zero in terms of the amount of exports that Iran was going to be allowed to push out into the market, and in reality the decline in exports from both Iran and Venezuela was more than offset by the increase in exports from other OPEC countries," Micheal Cohen, head of energy research at Barclays told CNBC's "Squawk Box" on Thursday. OPEC managed to hike output in September even as production from Iran and Venezuela fell. A Reuters survey forecasts that the 15-nation producer group pumped at its highest level since 2016 in October. Meanwhile, U.S. production hit an all-time high at 11.3 million barrels per day in August, according to the Energy Information Administration's first reading of monthly data released on Thursday. The nation's stockpiles of crude oil have increased for six consecutive weeks, another EIA report showed on Wednesday. At the same time, forecasters now think growth in oil consumption will be weaker than anticipated. Continuing trade tensions between the United States and China is raising concerns that slower economic growth will impact demand for oil. "Demand at $80 to $85 oil prices has started to slow, so overall we're looking at a balance for next year that actually flips back into surplus," Cohen said. "And so the question now is whether OPEC is going to let that happen, and we're not going to know until really that first week of December when they have their next meeting." OPEC, Russia and several other producers have aimed to keep 1.8 million bpd off the market since 2017. The group agreed in June to increase output after cutting more deeply than it intended. Last week, a committee of oil producers said it may reverse course once again given current economic conditions.